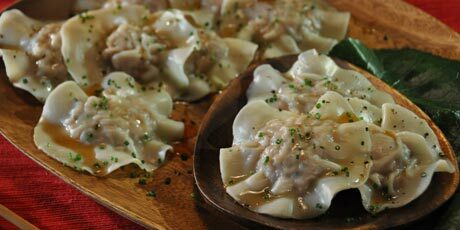 Ground turkey, ground pork, and cheese wrapped in wontons and drizzled with a sweet apple cider glaze. Makes 30 wontons. 1. Place apple cider in a large sauté pan over high heat. 2. Once apple cider has reduced by half and has achieved a thick syrup consistency, add black pepper, stir and set aside. 1. In a tall-rimmed sauté pan bring heavily salted water to a boil. Reduce heat slightly to a gentle boil. 2. To make filling, place all ingredients in a large bowl, except for wontons egg, chives and Apple Cider Glaze, mix well to incorporate. 3. To assemble Wonton Ravioli, place a wonton wrapper on a clean dry working surface and brush entire wrapper with egg wash. Keep remaining wonton wrappers covered while working to prevent them from drying out. 4. Place 1 tablespoon of meat mixture in centre of wonton wrapper. 5. To cover, gently stretch another wonton over top, connecting the edges of the wrappers, press to secure. 6. Gently lift, cup hands over filling to release any air inside, pinch around rim to secure and place on a dry tray. Repeat with remaining wontons. 7. To cook, gently place five wontons in water, turn over half way though cooking and remove once meat is cooked and no longer pink, approximately 5 minutes. 8. To serve, place Wonton Ravioli in a large bowl, drizzle with Apple Cider Glaze, place on a serving dish and garnish with chopped chives.